If you're looking for a cool, rare roadster, this car would be worth checking out. Located in Dover, NJ, click here to see the eBay listing. 1993 Oldsmobile Cutlass Convertible - If you're like me, you've probably forgotten that Oldsmobile ever built this car. Is it an exciting car? Nah, not really, but it holds a place in American automotive history. 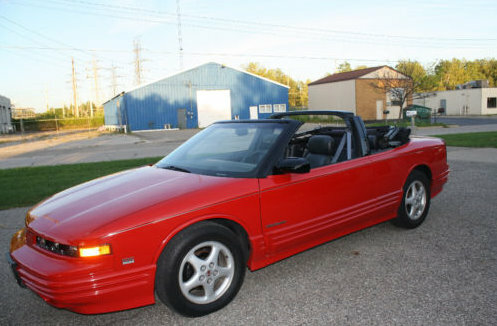 It's the only American convertible to be produced with a roll bar (of sorts). GM was forced to use the roll bar setup because the door handles on the coupe - on which the convertible is based - are in the B pillar. It's not an exciting car, but it's not awful, either. The 3.4 liter V6 puts out 200 HP and gets the car to 60 MPH in less than 9 seconds. The suspension is set up more for a smooth ride than sharp handling, but it's a lot better than American cars of decades earlier. This car is in very nice shape. It has 64,000 miles on it and the seller says it has "no physical damage inside or out". Located in Burton, MI, click here to see the eBay listing. 1977 Triumph TR7 - I'm posting this car for no other reason than it still exists. 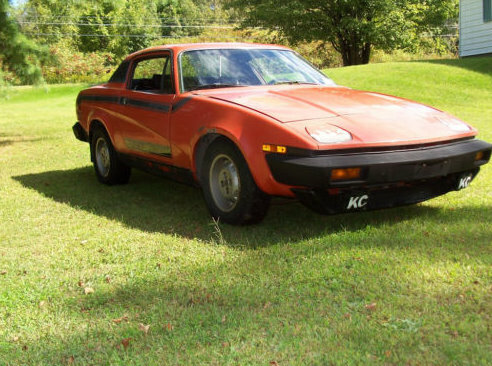 How many hardtop TR7s with automatic transmissions can there be left in the world? I like TR7s. I'll probably get around to owning one someday. But there's no chance it will be a hardtop with an automatic. This car still has its original AM / FM / 8 Track player. It's a time capsule, that's for sure. Located in Rome, NY, click here to see the eBay listing. Anon - Good point. It was. I remember having a discussion with a fellow car geek at the dawn of the 90's about which cars had the most futuristic look that would define the coming decade. We came up with the Lexus SC coupe, The Chrysler/Mitsubishi Diamond Star triplets, and the Oldmobile Cutlass. Considering how staid and tradition the previous generation Cutlass was (and such a HUGE seller), it was truly amazing that Olds went so far 'out there' with this design. And granted, I am talking more about the coupe more than the convertible or sedan. 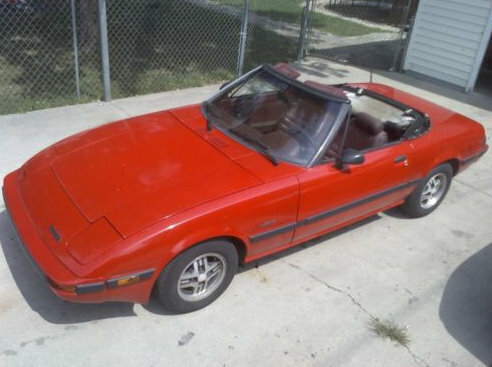 That RX7 convertible is quite interesting. Too bad I'm 6' tall and therefore will not fit in any early RX7.